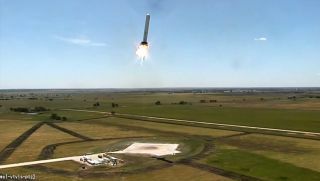 SpaceX's reusable Grasshopper rocket flies sideways during a 100-meter (328-foot) lateral test flight on Aug. 13, 2013 in this still from a video recorded at SpaceX's McGregor, Tex., proving grounds. For decades, the aerospace industry has sought to build a fully reusable rocket launch system to bring down the cost of ferrying people and payloads into orbit. Despite dozens of concepts and millions of dollars directed at that goal, no truly reusable system has been created yet. What does it take to build one? Because of our planet's gravity, getting into low-Earth orbit from the ground is a daunting task, even for rockets that are designed to burn up in the atmosphere, never to be reused again. Twenty years after it made its first flight, the Delta Clipper Experimental, or DC-X, is getting its day in a museum. An exhibit on the reusable rocket prototype called DC-X SpaceQuest is being prepared at the New Mexico Museum of Space History in Alamogordo. This photo montage shows how the DC-X reusable rocket prototype launched and landed vertically during trials in 1993. Hitting the 17,500 mph (28,164 km/h) required to escape Earth's gravitational pull requires powerful fuel — and a lot of it. NASA's retired space shuttle, which came close to full reusability, had two solid rocket boosters each packed with more than 1 million pounds of solid propellant. These jettisoned from the system two minutes after launch, deployed parachutes and gently dropped into the ocean, where they could be recovered and reused for another mission. But each of the 135 shuttle flights also relied on a 15-story external fuel tank loaded with more than 500,000 gallons of extremely cold liquid oxygen and liquid hydrogen fuel. This giant container was disposable and burned up in the atmosphere once it delivered the orbiter to space. A fully reusable craft would not have any such expendable parts. The DC-X (Delta Clipper Experimental) was a prototype for a reusable space launch vehicle tested in the 1990s. See how reusable launch systems can work in this full infographic. Another even more challenging task looms over the goal of a totally reusable spacecraft: creating a single-stage-to-orbit, or SSTO, launch vehicle that would carry into orbit and back everything with which it left Earth. With no reassembly required, it's hoped that an SSTO craft could be operated like a commercial airliner. But designing an SSTO vehicle comes with its own host of technical obstacles. Empty fuel tanks become dead weight and reusable vehicles require elements to protect the spacecraft when they re-enter the atmosphere, which means even more added weight. "Reusability requires thermal protection, landing gear, landing propellant and wings or a lifting body," French said. Strong and lightweight carbon composite materials, for example, could be incorporated into rockets, said Jim Paulsen, vice president and deputy of advanced space and launch at Florida-based firm Aerojet Rocketdyne. "They are extremely strong and you can control the strength by weaving the direction," Paulsen told SPACE.com. "The casings on a solid [rocket booster], you can wrap them with carbon fiber and come up with a very efficient design and a very lightweight design and that's what being used by Aeroject Rocketdyne's Atlas 5," he added. Rocket makers are also turning to selective laser melting, or 3D printing, to make metal parts. This technique would not only reduce the time and cost of producing complex rocket components, but it could also help solve the weight problem. "It would almost be like a skeleton in your body," Paulsen said. "You print the material where to control the amount the stress it can handle." Why make a fully reusable rocket? "Everyone that talks about being in this business in the long haul says eventually we've got to solve this reusability issue," Paulsen said. "Space travel is exciting and it has a lot to offer and it’s a new frontier … One of the critical things to make it truly successful in the future will be to make the vehicles and the hardware and engines reusable." The DC-X resusable spacecraft is seen with engines flaming. The space industry often points to the airline business to illustrate how reusability made a once-new and expensive form of transportation familiar and low-cost. Though a new Boeing 747-8, for example, costs around $350 million, fuel and operations are much less expensive by comparison. Once a passenger flight lands, the plane can be rapidly prepared for its next trip and it can make thousands of flights over its lifetime. The DC-X rocket prototype was an experimental vehicle of the early 1990s that demonstrated the same could one day be true for spaceflight. The nearly 40-foot (12 meters), cone-shaped experimental rocket was never intended to go to space, and none of its test flights lasted more than three minutes. But it was rapidly developed and could be flown over and over again with a quick turnaround time, raising hopes that a fully reusable SSTO spaceship might one day bring routine payloads into orbit. Twenty years later, some space industry leaders at the DC-X conference argued that reusable spacecraft wouldn't have to be as efficient as a commercial airplane; just using one vehicle twice could dramatically cut costs. "We don’t have to be at 100 times or 1,000 times [reusability] to get the lion share of the benefit of reusable technology," former NASA administrator Mike Griffin told the group. Despite the challenges, some private space companies, such as entrepreneur Elon Musk's SpaceX, are attempting to make fully reusable rockets. The craft SpaceX envisions (and has been prototyping through its Grasshopper rocket project) would have three major parts: a first stage and second stage booster that would separately fly back to Earth and an orbital space capsule that would lift off and touch down vertically on land. The pieces would have to be put back together again before the spacecraft's next flight, but all would be reusable. "This has been attempted many times in the past," Musk told reporters in 2011 when he unveiled the project. "We could fail. I'm not saying we are certain of success here, but we're going to try to do it."